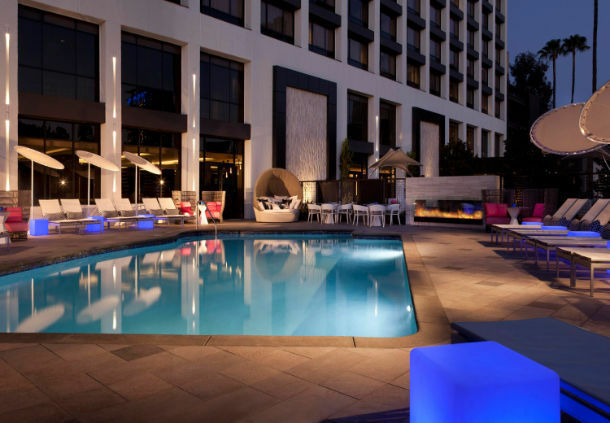 We didn’t even realize there was a Marriott in Beverly Hills, let alone one with a pool! And, it’s on the ground floor. As hotels build up and rooftop and deck pools are becoming the norm, finding a pool that’s actually in the ground in Southern California is starting to be rare. This one is very no-frills, and sits at the front of the property, facing South Beverly Drive. But it’s a surprisingly quiet corner of Beverly Hills. Not a bad option if you’re looking for a cool day. The furniture is updated. I didn’t see any poolside service when I was there. Though they may offer it during busy weekends. No scene here, just a pleasant place to cool down. More hotel pools of Beverly Hills.